"Are You Frustrated By All Of The Technology You Need To Know Before You Can Make Some Real Money Online With Your Writing?" 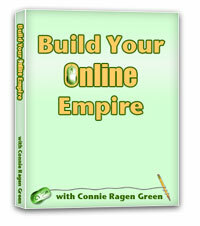 My name is Connie Ragen Green, and I've been online since 2005. I struggled that first year, and do not want you to lose any time in getting started. Claim Your FREE Recording and Transcript - TODAY! Fill out the form below and click the button... you'll immediately receive information on how you can build an online business based on your writing and life experiences.